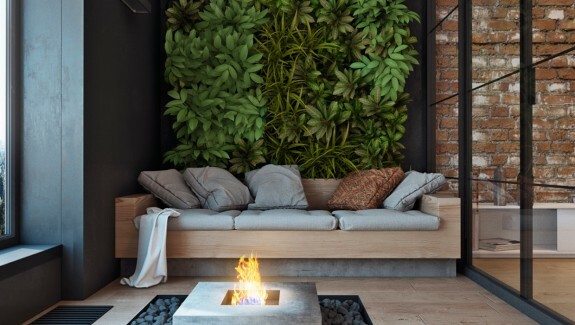 Have an exposed brick wall, but not sure what to do with it? 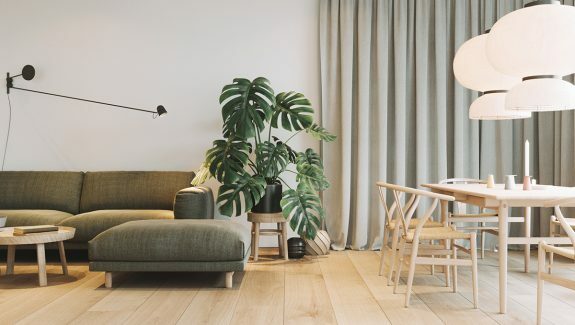 These three inspirational homes – sized as smaller apartments or more luxurious two-storey dwellers – use exposed brick, wooden paneling and shades of grey to create modern spaces. 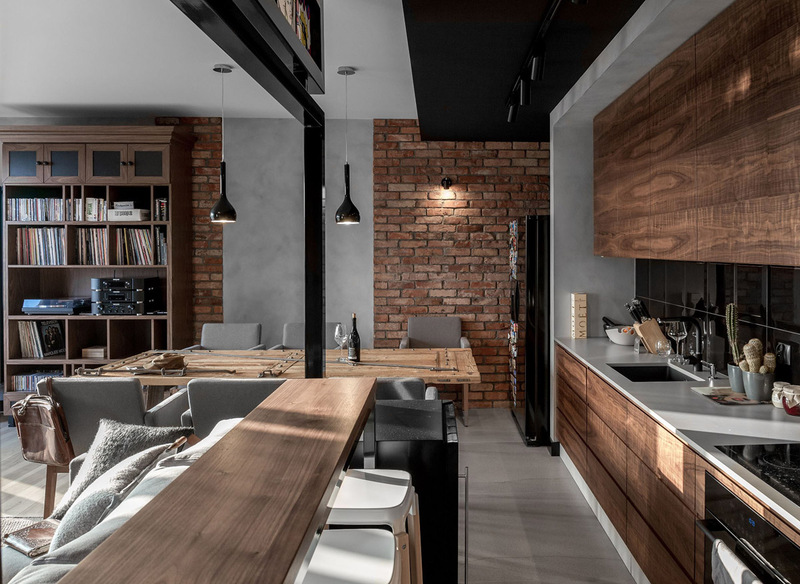 Long lines of wood construct kitchens with grey benches ending in exposed brick walls. 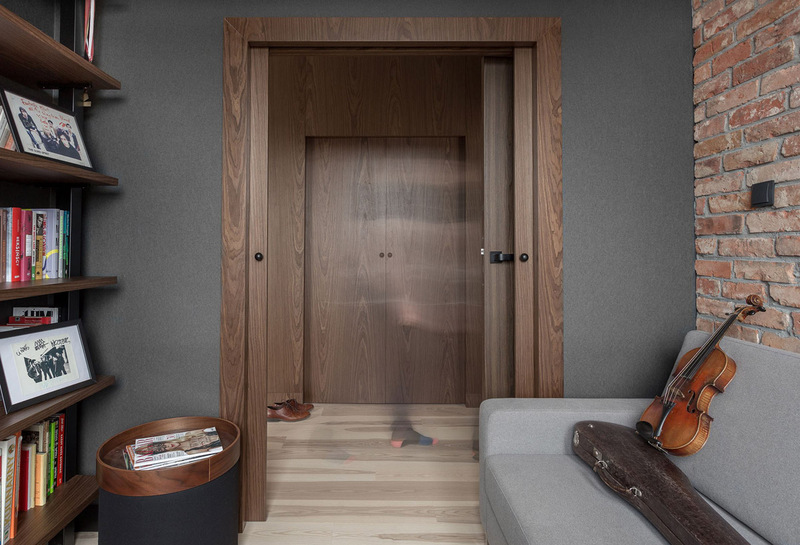 Wooden doors shake off their natural grooves to reveal bookcases. Exposed brick tiling holds a faucet, and wooden shelving a sink top in a stone bathroom clothed in grey. 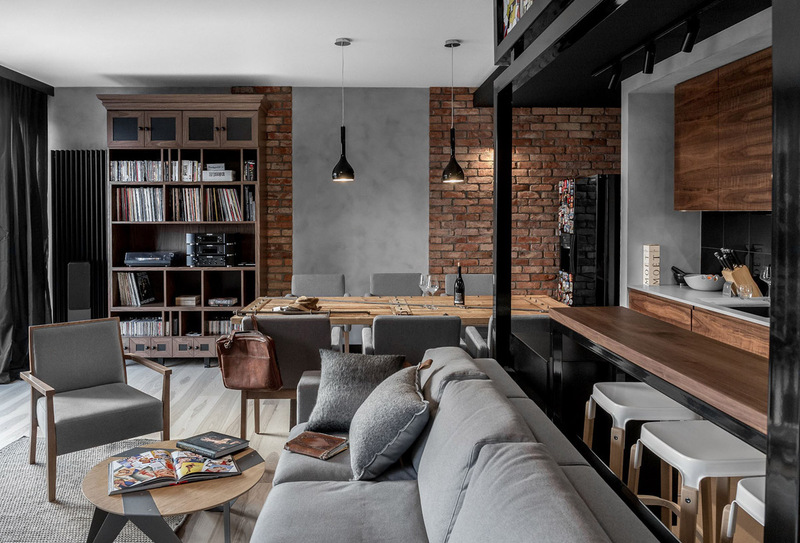 Get inspiration and design ideas for your exposed brick facades, with these three homes combining brick, wood and grey. 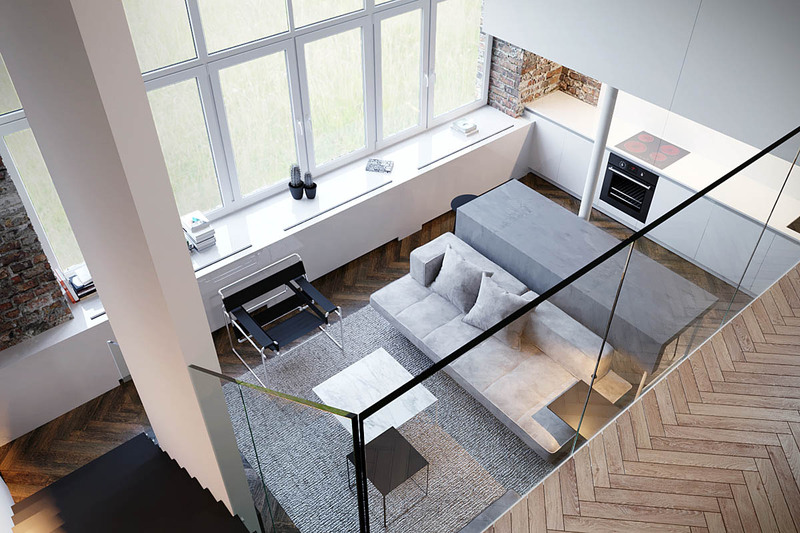 Our first home uses grey, brick and wood in a loft for an IT specialist, a home designed to repel negative thinking and clutter. 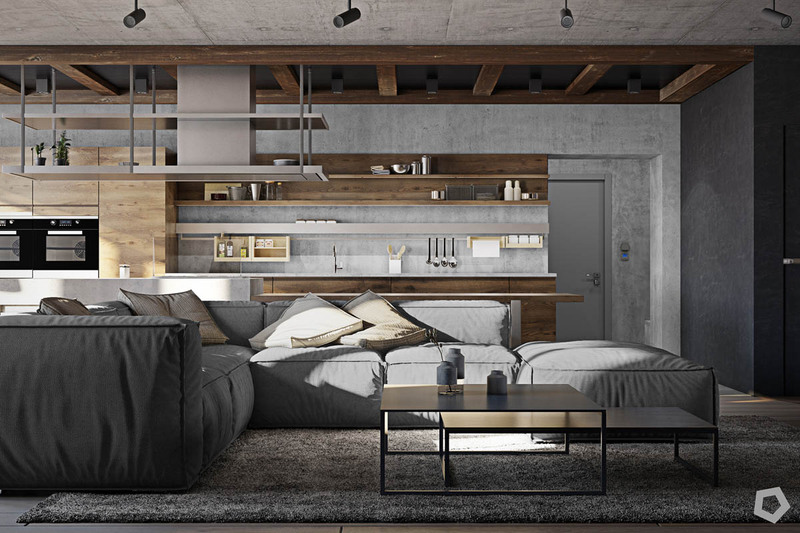 Opening to the living room, spaced wooden rafters cling to the ceiling, while a relaxed grey couch offers a seat beneath. A base in grey – spreading from two different paint shades in the walls, to a floor rug, coffee table vases and extractor fan high shelving – keeps the mood calm, refreshed and not too busy. As we zoom further out, the Menu Willmann vases on the coffee table find friends in other small, grey-hued things. A row of aluminium camera lights draw squares around the ceiling; door handles shine bright in silver; a grey abstract houses smaller shades, on the wall opposite. An exposed brick wall makes an appearance to the right. Looking towards the TV, more exposed brick meets the eye. A standing lamp harks to the rows of camera lights above, boasting a similar style. Wide windows to the right open up the room, lighting a fern and making reflections off the screens. 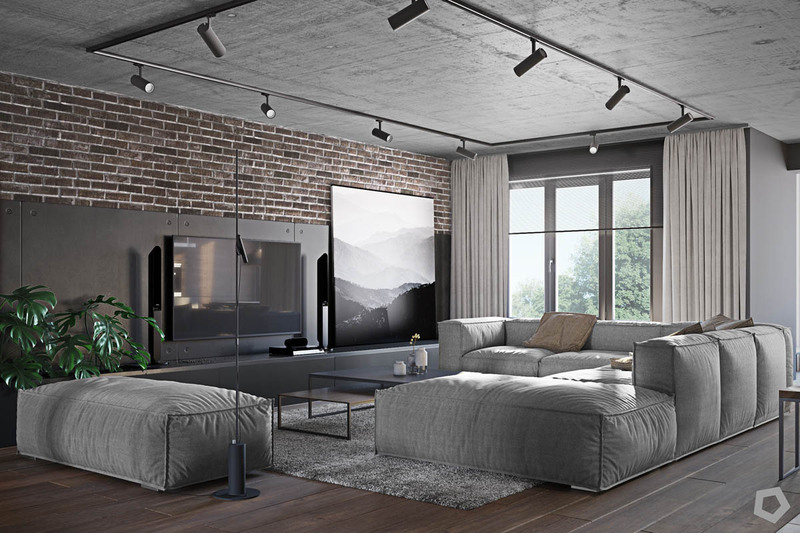 A large grey panel beneath ensures red brick doesn’t dominate. 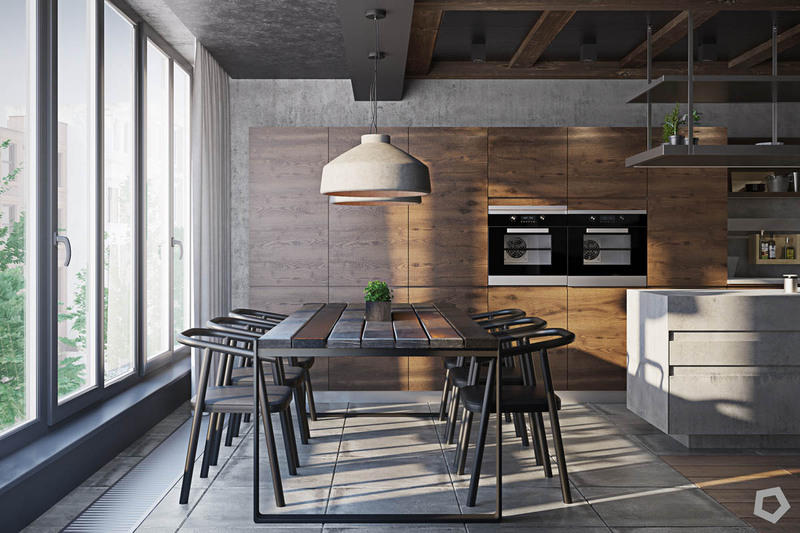 The dining area wows with modern dining pendants in a lighter grey. Wooden panels show themselves in a reclaimed table and warmer kitchen cabinetry, harking back to the paneling in the kitchen. Two in-built stoves and a mini potted plant also catch the eye. A front-on view reveals open kitchen shelving, indented stools and a community of lines that stretch across the island, cabinetry, rafters and upper shelving. 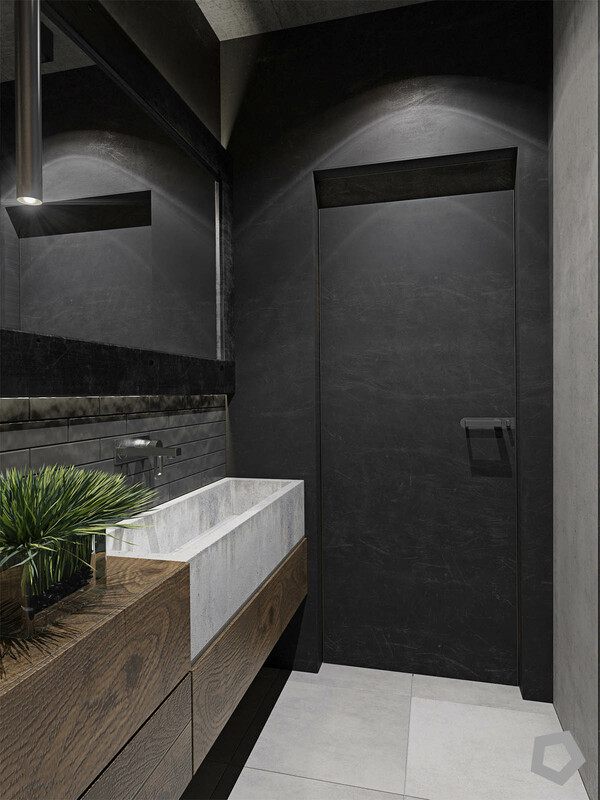 Here, wooden paneling and grey stone mingle seamlessly, equally sharing the visual impact. 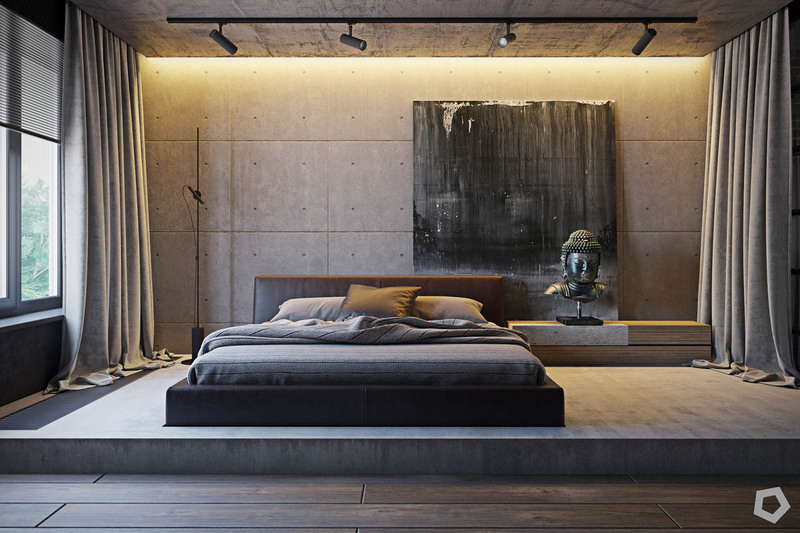 The concrete-walled bedroom offers a similar schematic, with a wide, open space joined by horizontal lines. 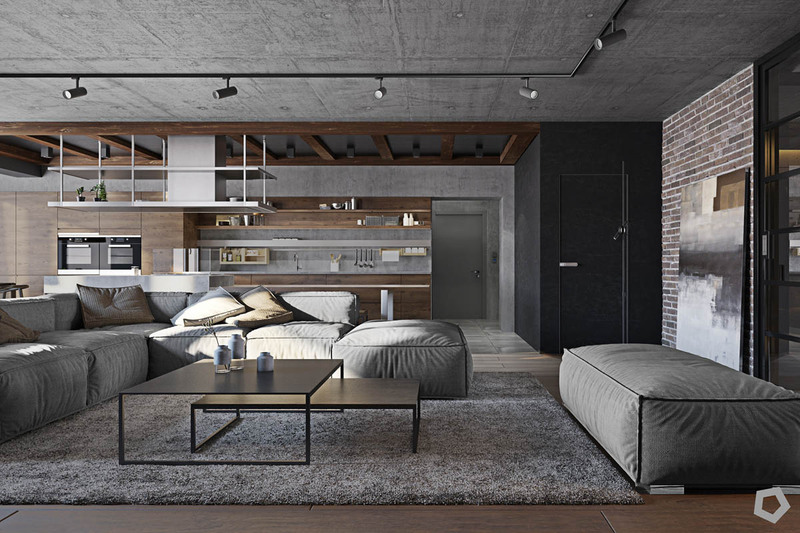 A low concrete platform raises the futon, which boasts a headboard in brown leather. Grey curtains hide and reveal outside light, while a rough abstract painting harks back to the lounge. A distressed wooden side table holds a Buddha talking to its owner’s beliefs. More camera lights tie in the rest of the interior. 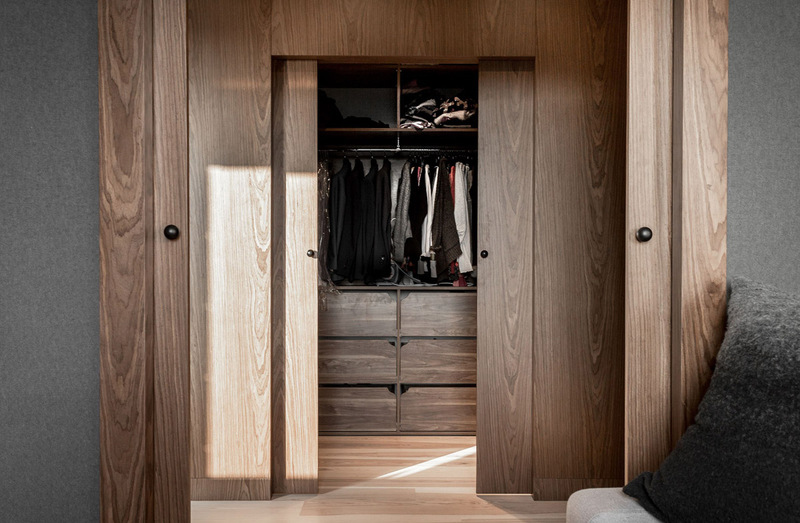 A row of dark glass cabinets form the wardrobe, artfully keeping clothing in whilst alluding to more space. The office, once hiding behind Japanese doors, makes the most out of more grey and wood. 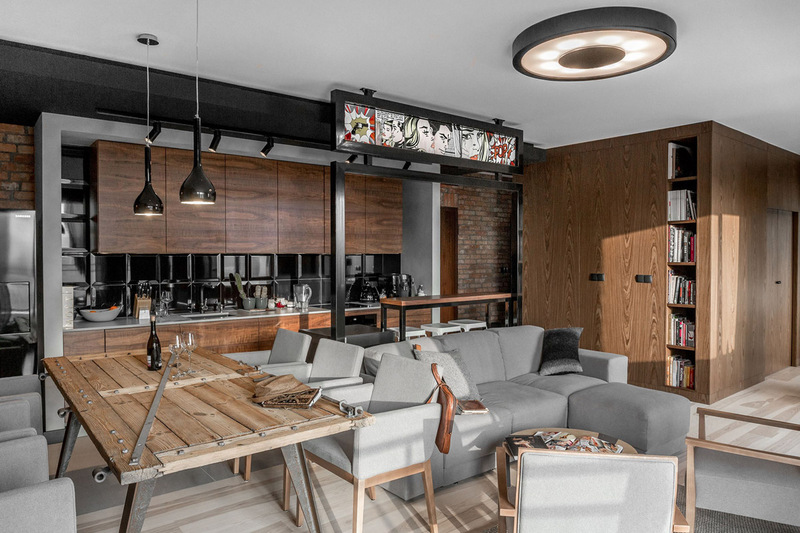 Varnished wooden planks cover one floor and wall, while a concrete door, wall and ceiling keep it from feeling too boxed-in. 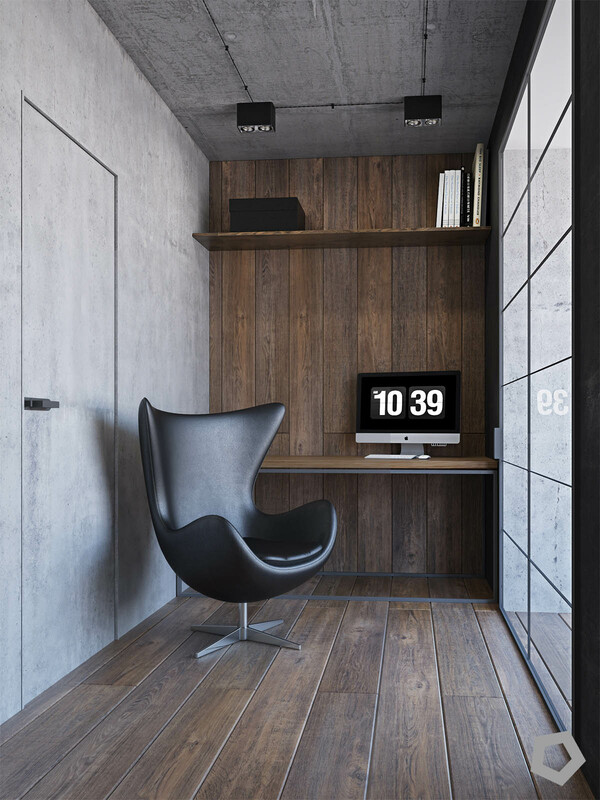 A high shelf and modern leather chair are welcome elements. 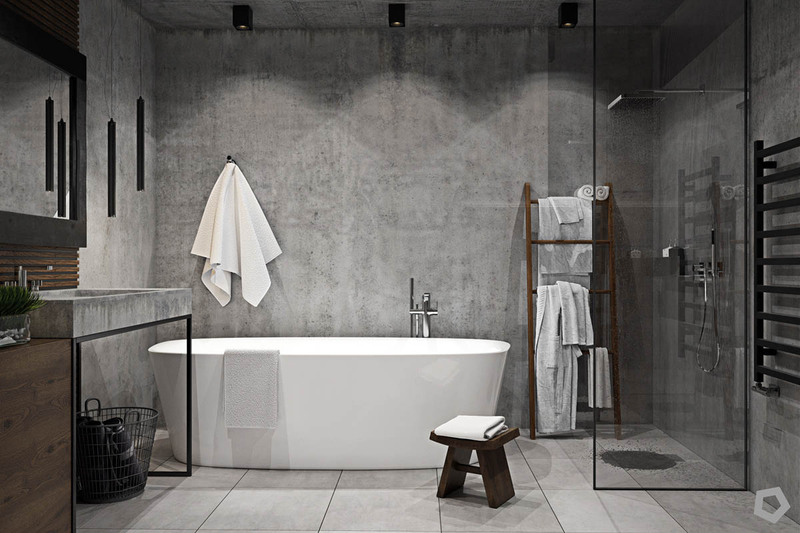 Shrouded mostly in concrete, the bathroom wows with a standing bath in porcelain. Accentuated with black pendant lights, a wooden towel ladder, one-walled shower and dressing chair, it pairs a feeling of elegance with an absence of clutter. 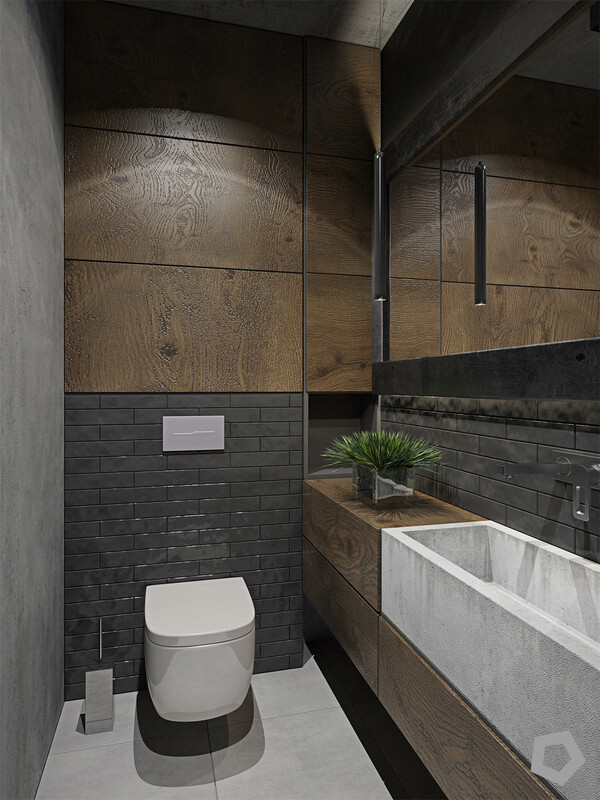 Similar in style, the toilet pairs exposed grey brick tiling, a wooden bench and concrete finishes into a perfect use of space. Lit by a dangling pipe and enlivened by potted grass, it makes this potentially-tiny corridor feel more spacious. 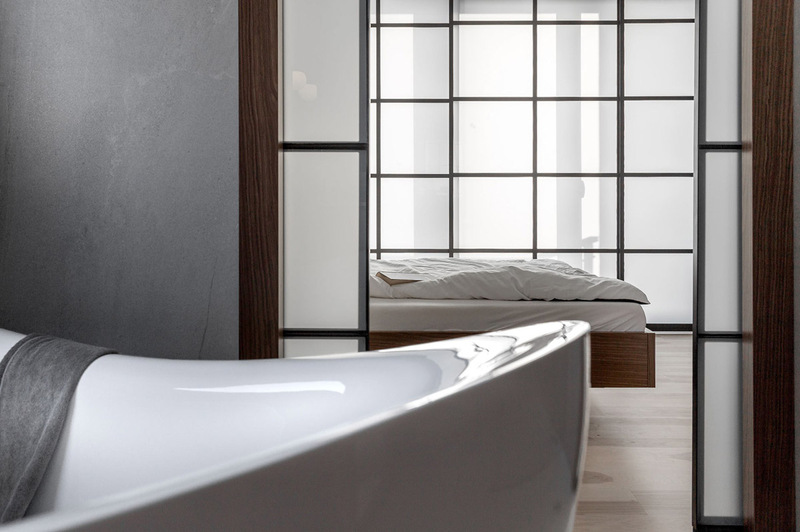 Paired with a mirror to expand the space, wooden paneling and a porcelain block toilet complete the look. 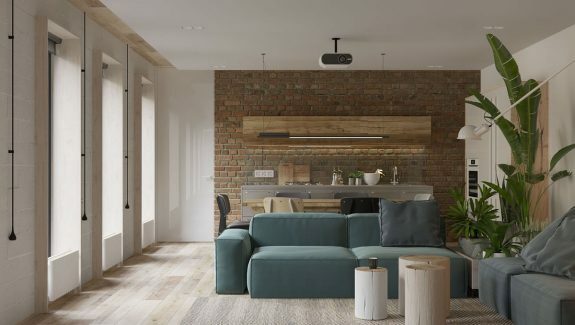 Our next interior, this time a two-floor apartment in a former art studio, uses exposed brick, grey, wood and a dash of turquoise to create a couple’s haven. Inviting us in, the main living space blocks out walls in turquoise and exposed brick, using a layer of white to keep the look open. Grey covers the furniture in an ottoman, island bench and rug. Black joins the party in a stylish accent chair, here the classic Wassily chair, which matches the cactus pots and a squared-off coffee table. From side-on, a few more black elements make an appearance. Modern end tables with black stencil legs and a wooden top accompany the sofa. A black TV occupies a plinth, while the panel underneath gives it structure. Looking towards the turquoise wall, two levels emerge. 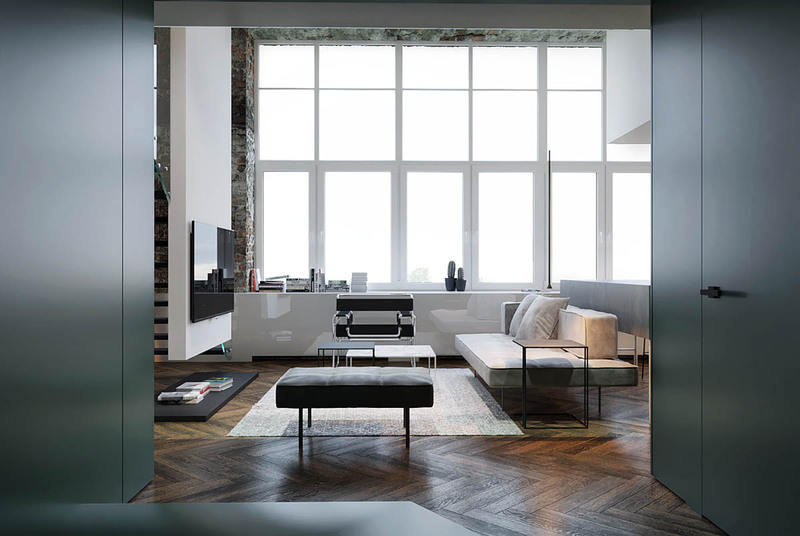 A zig-zagging wooden floor keeps the look cohesive, while white, glass, black and grey play. Another column in brick meets the eye behind a bevy of kitchen bar stools. Turquoise shows the way upstairs, while full-length white windows illuminate. 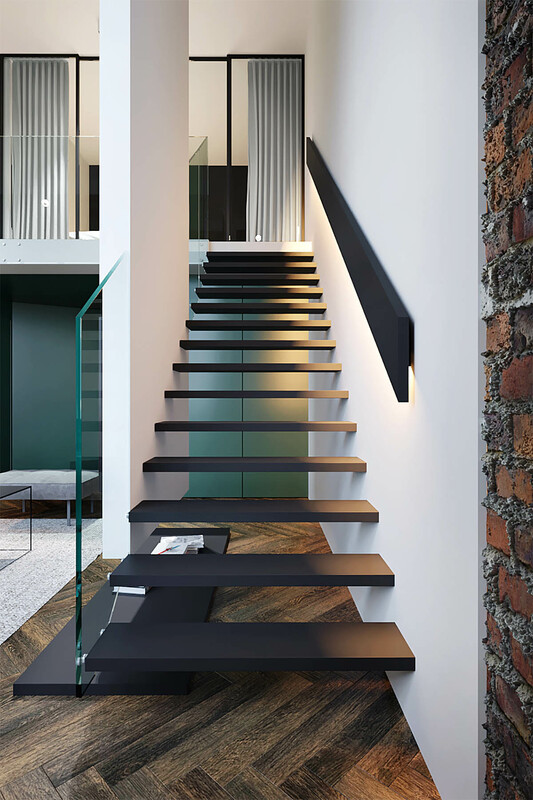 Above zig-zagging wood, beside exposed brick and leading up to a room in white runs the staircase, a series of classic steps that almost appear to be floating. 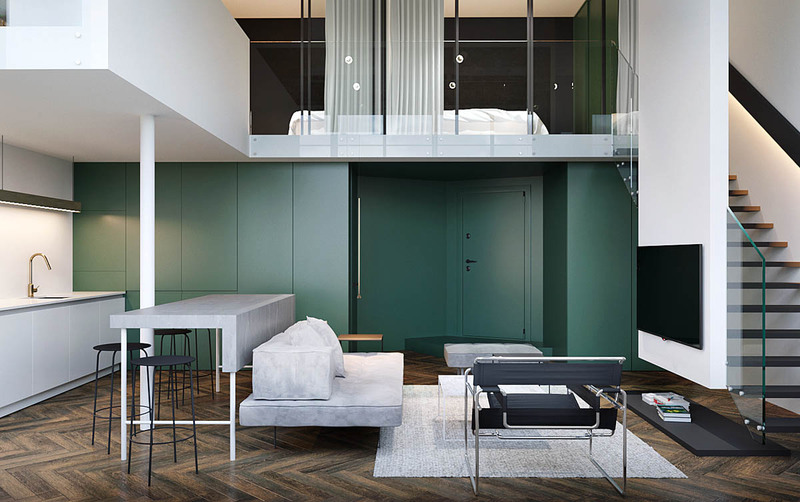 A touch of turquoise to the back reflects off a pane of glass railings. Unframed glass barriers keep the view unobstructed. 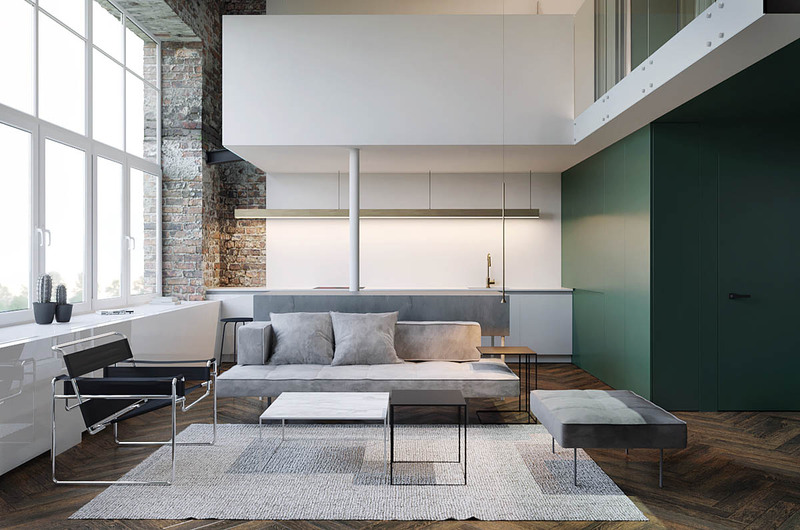 Framed by a L-shape in white, grey elements in the kitchen island, rug and sofa reappear. 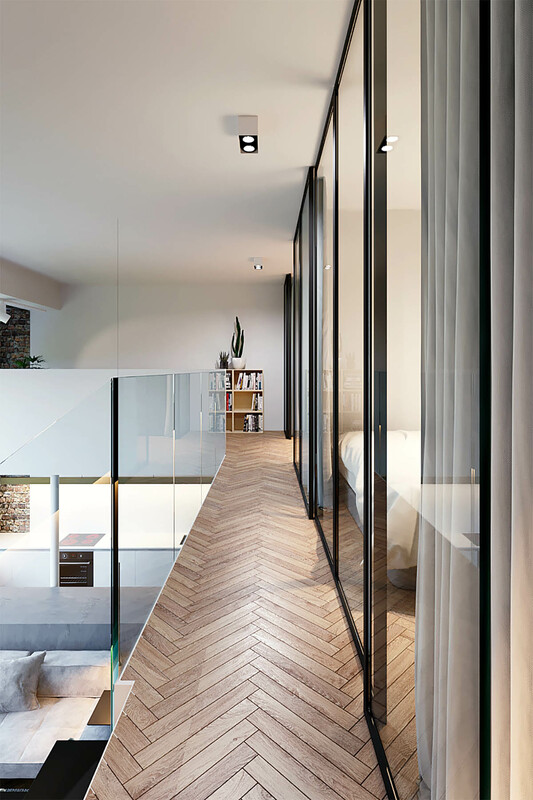 Stretching along the bedrooms and towards the study, the lower level’s zigzagging wood connects the interior. Glass doors and a white wall at the end make its corridor appear bigger. 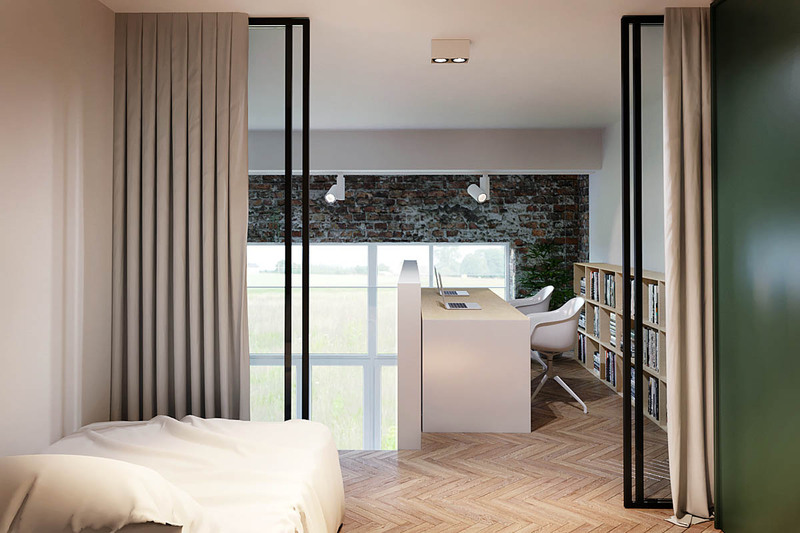 From a bedroom to the study, the interior’s central elements become more prominent. Turquoise covers a wall to the side, as exposed brick stretches from the ground floor to the ceiling. 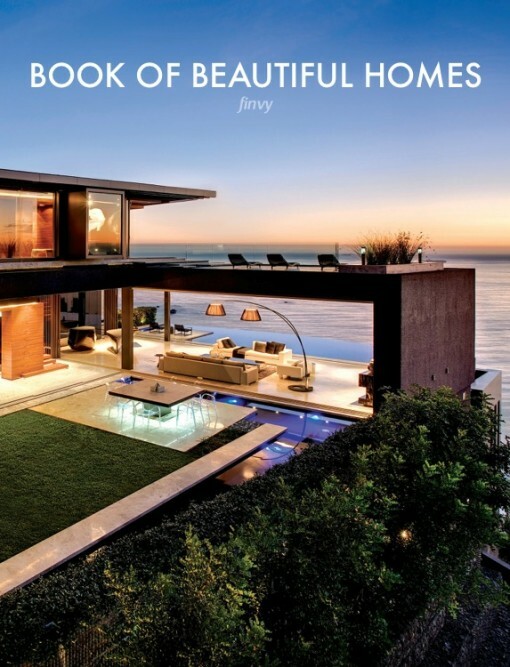 Curtains in grey tie in the couches, while wood constructs a row of low-down bookcases. 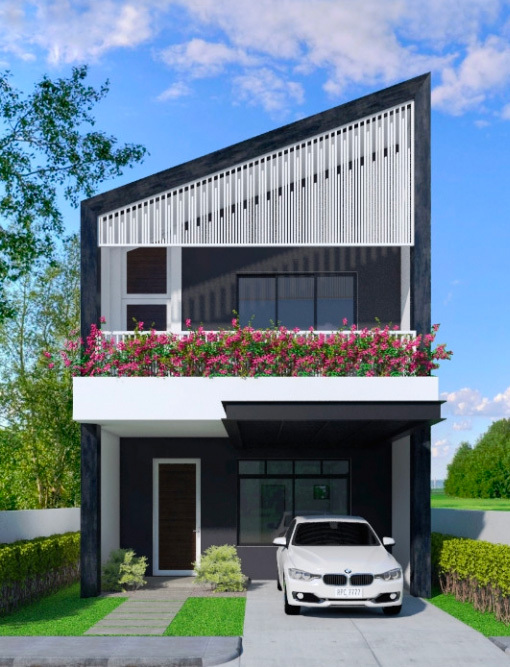 White adds light to the rest. Closing off the space, a model for double workspaces looks out. 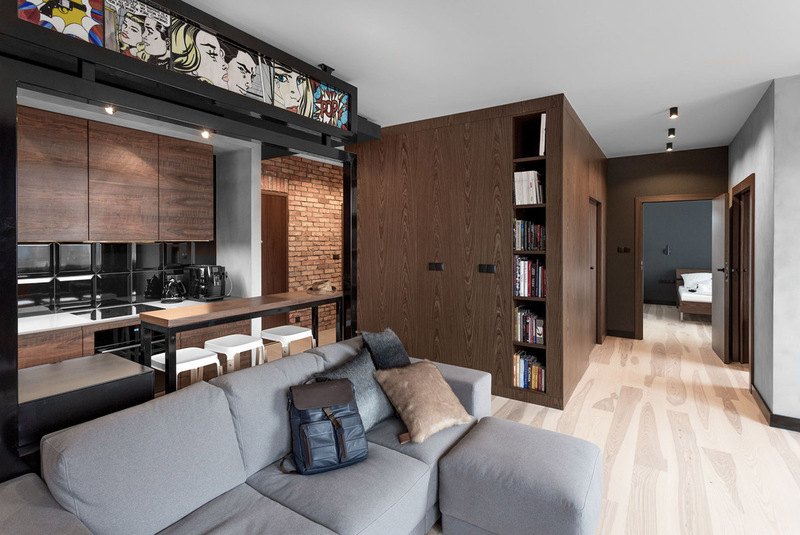 Exposed brick covers the one side, black stencil door frames the other, as white cubby chairs work together on a shared wooden desk. 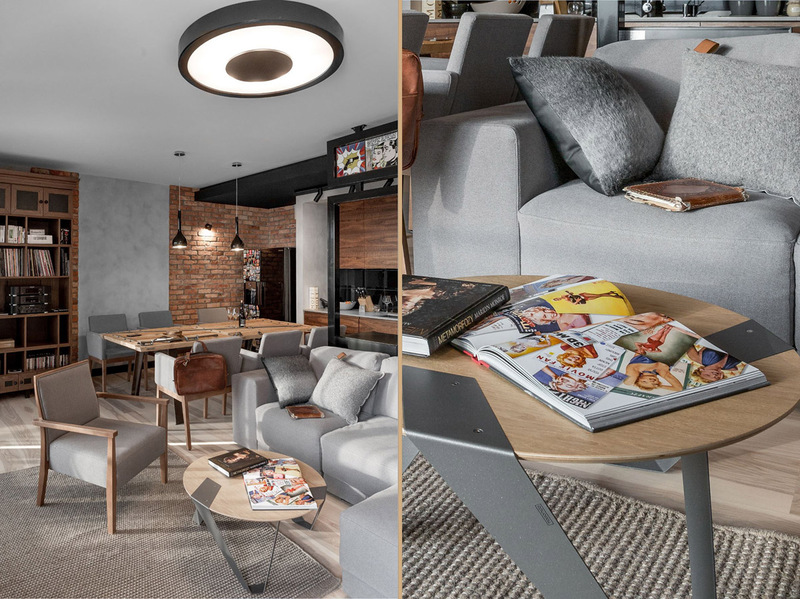 Our final space, a 100sqm apartment in Gdansk, Poland, combines exposed brick, wood and grey with a bevy of comic strips. 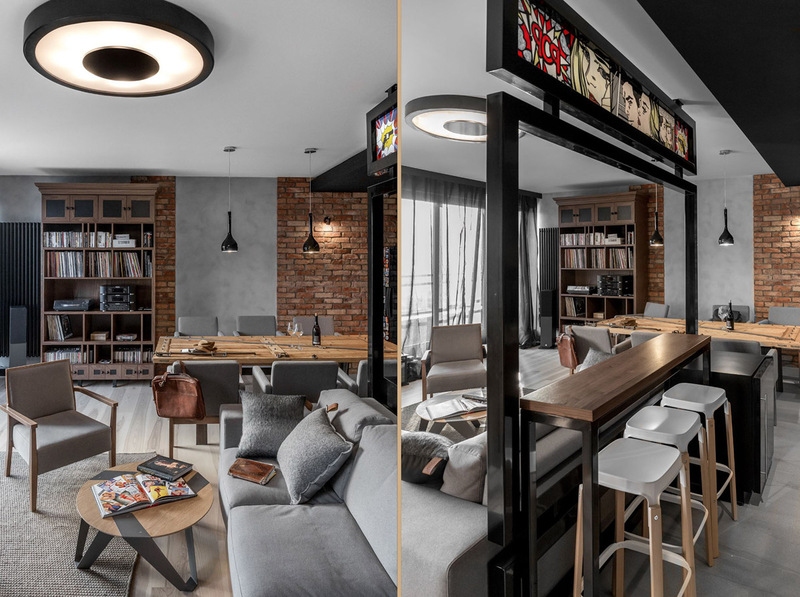 Opening naturally to the living room, exposed red brick meets with black dining room pendants, large wooden panels and furniture in light wood and grey, which together exude a relaxed attitude. Small details in pop-art fridge magnets, an open comic book and a bookcase lined with vinyls foreshadow elements to come. 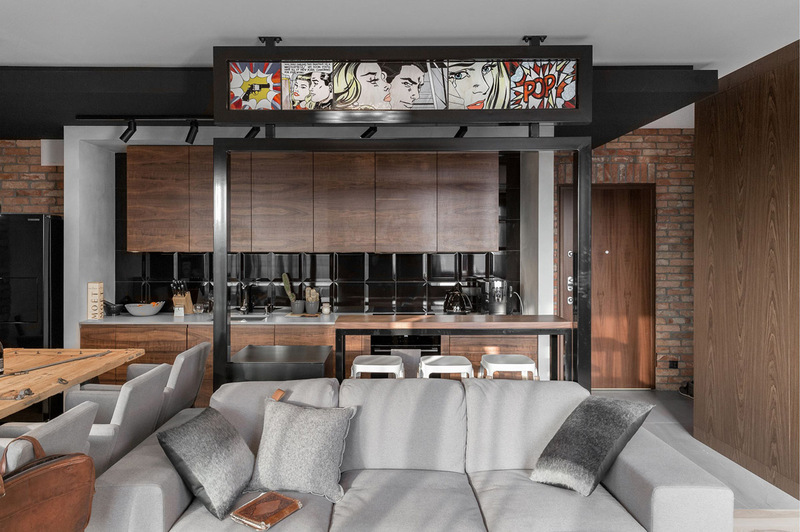 As a round light hugs the ceiling, a strip of comics heads the kitchen, an unusual surprise above a black iron frame. 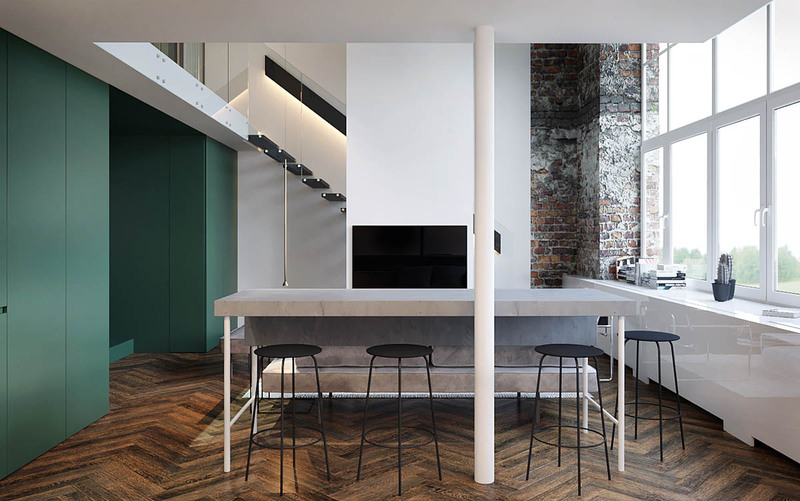 Whilst the dining table turns industrial with steel legs and bolts, more exposed brick reveals itself in a small wall by the door. 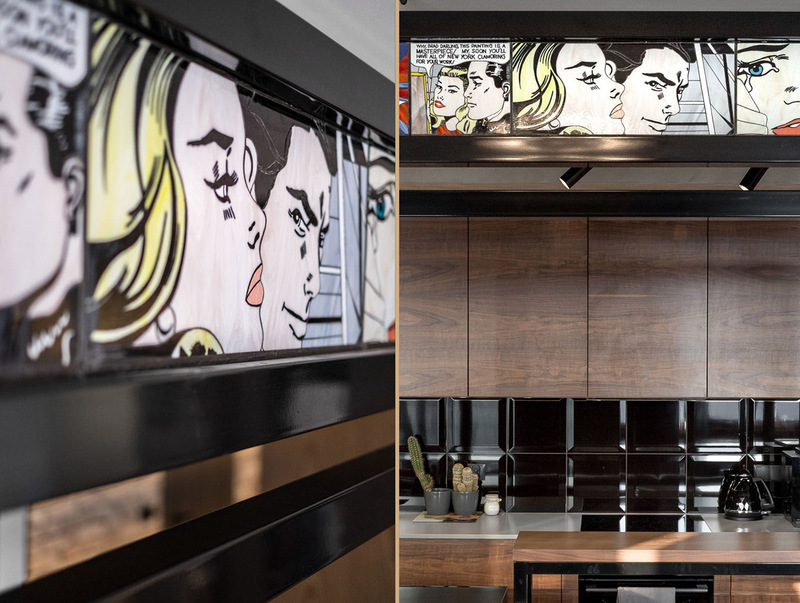 Looking towards the kitchen, the comic strip dominates. Its frame over the kitchen makes the people within seem characters, performing real-life charades in their everyday business. As we glance in the bedroom’s direction, a multitude of browns become apparent. 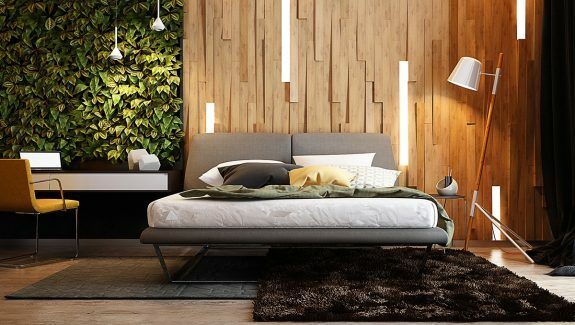 Light wood connects the rooms, creating space. Grained wood covers the kitchen, storage cabinets and entrance. 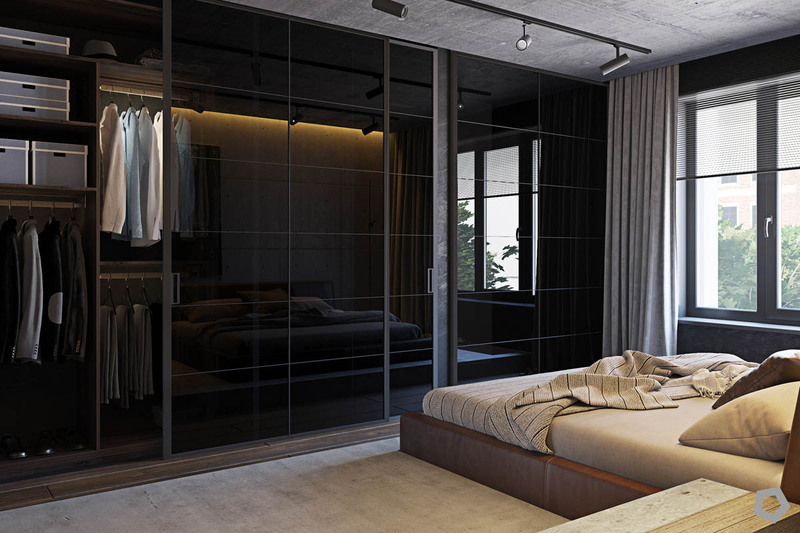 The bedroom’s door frame is coloured in dark brown paint, a subtle shade that keeps the look eclectic. 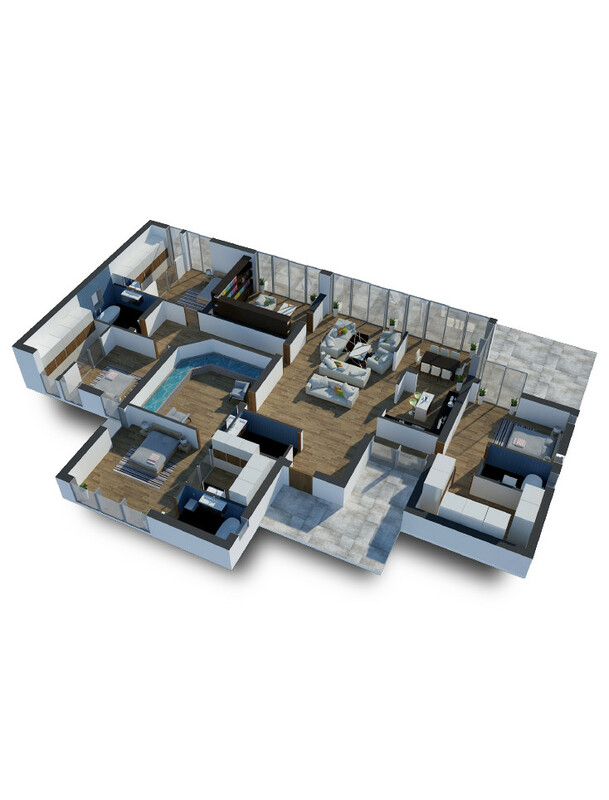 Although the rooms seem ever-changing, similar materials and shades ensure they don’t look busy. In the living room, monochrome plays in the light fixture, wood covers the bookcase, and grey offers a seat. 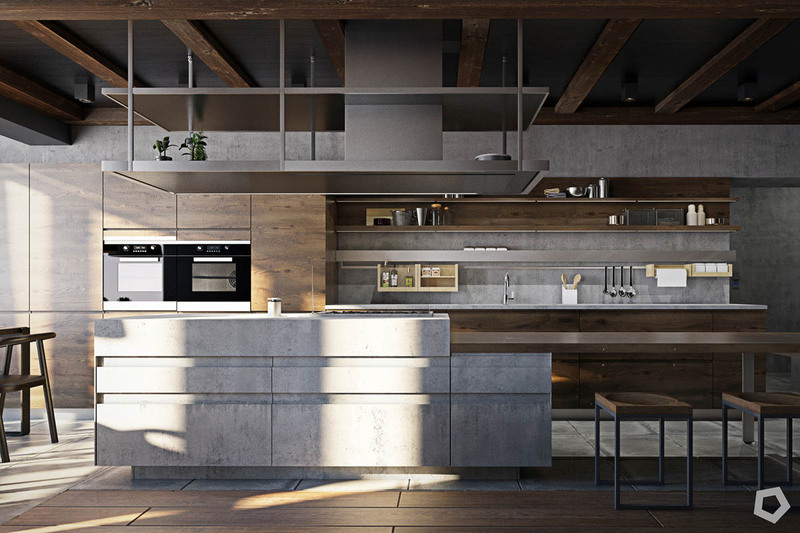 In the kitchen, monochromes play in the kitchen frame, wood covers a bench, and grey offers a washable concrete floor. Details in the comics also add contrast, with illustrations juxtaposing against smooth surfaces. A scattering of books shows the owner’s character. Pin-up girl clippings cover the coffee table, while a diary shows usage in a place on the couch. The feature bookcase provides an opportunity for snooping. Dull and shiny materials add depth to the interior. 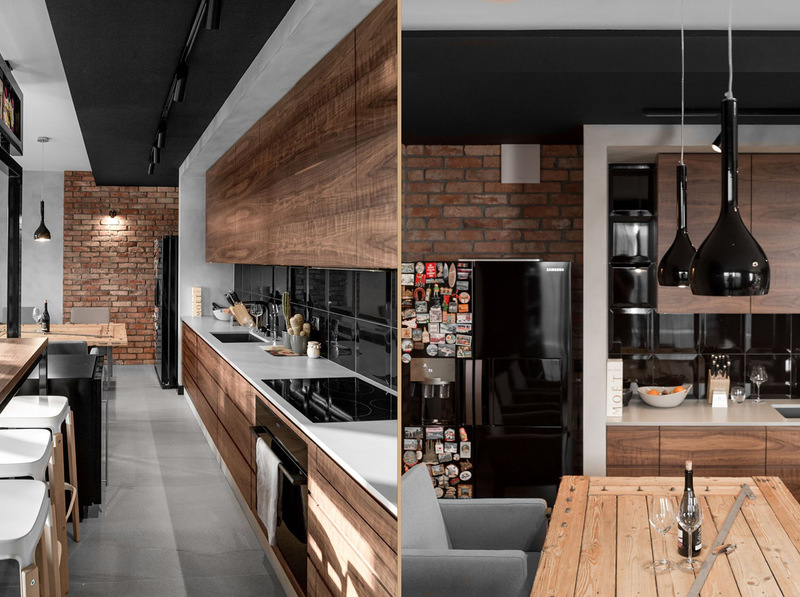 Shiny black appliances, hanging pendants, a fridge and splashback tiles work well in the kitchen, where long swathes of rough or grainy wood make the space feel more traditional. 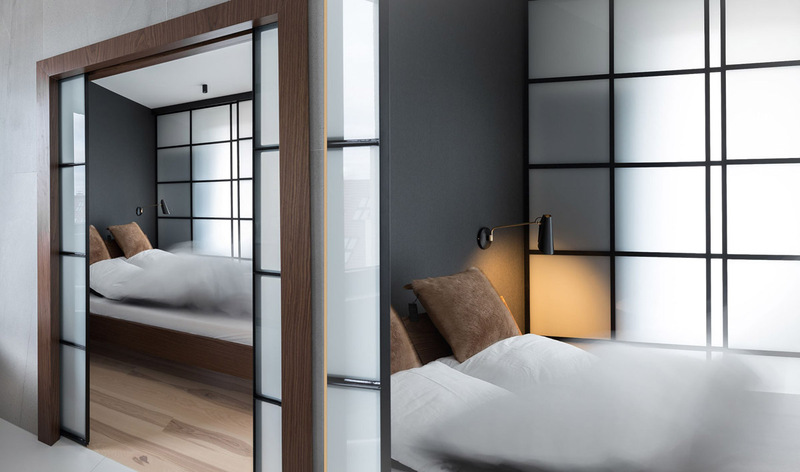 As the door to the bedroom beckons, we find ourselves in a room peppered with Japanese-style windows, a bedside drum and modern wall sconces. 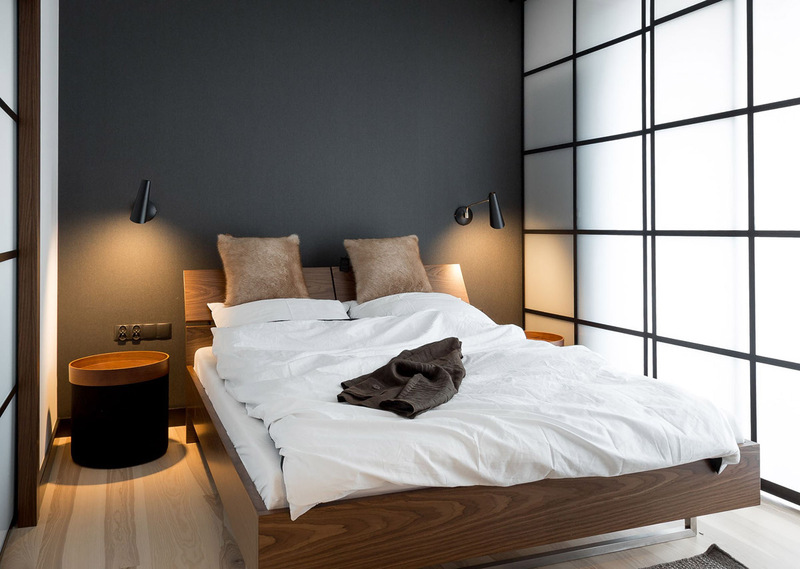 A dark grey feature wall plays beside a wooden bed frame and almost-matching floor. 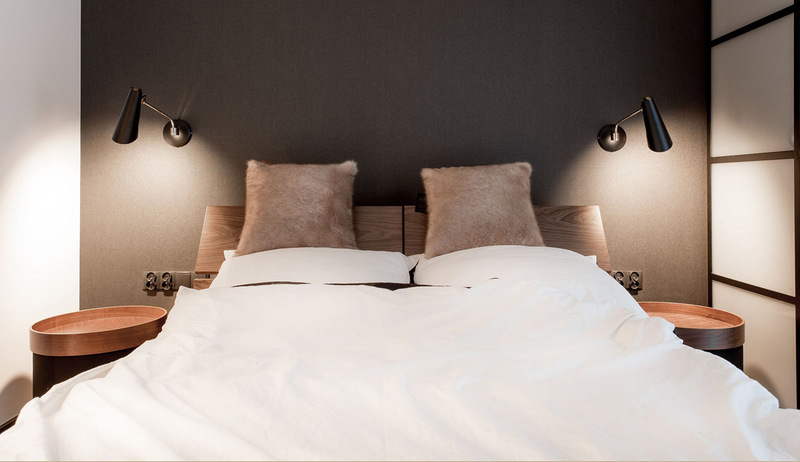 Leaning in closer to the bed, similar shades play with textures in a wooden headboard, polished wooden drums and light fur pillows. 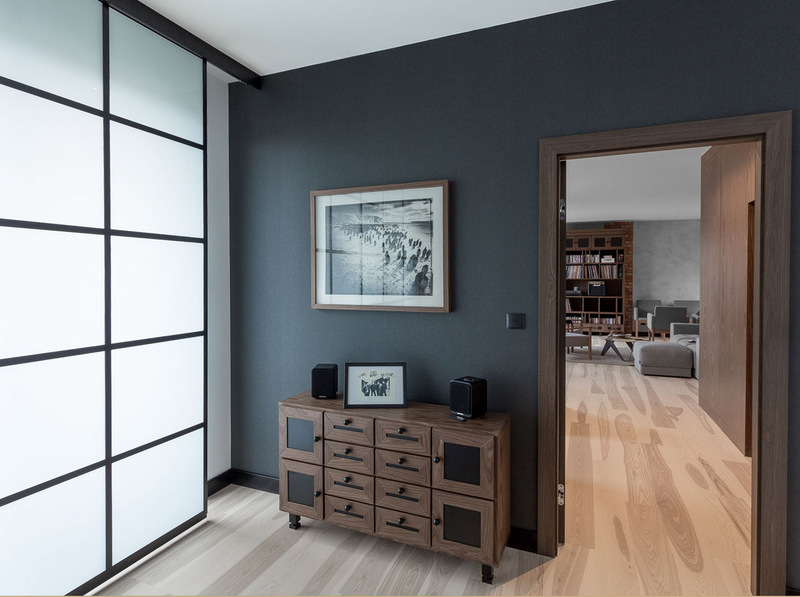 Black elements in the wall sconces and window frames polish off the look. A bath lurks from afront the bed, in an adjacent bathroom. 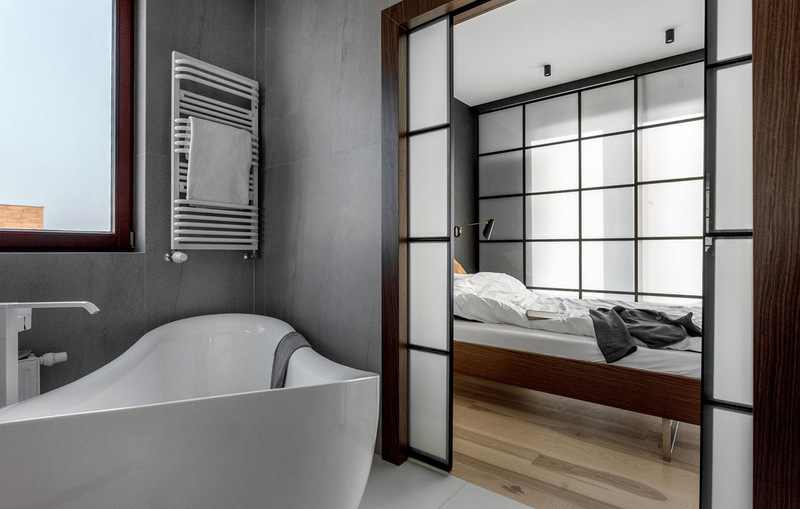 Snuggling into the corner, its grey walls mix with a thick white towel rail and Japanese windows, which slide to enclose the bedroom. 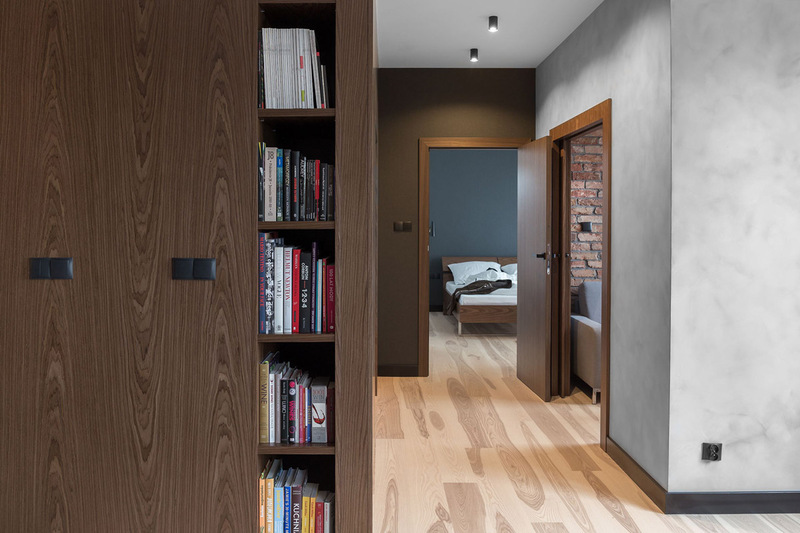 Harking to the bedroom’s feature, another grey wall holds a set of drawers reminiscent of the bookcase. A couple of framed paintings evidence different artistic tastes. Another sitting room peeks around the corner, filled with musical instruments and entertainment. Afront wood shrouding a wall and door, a violin relaxes beside its case, while the bedroom’s bedside table holds the latest magazines. 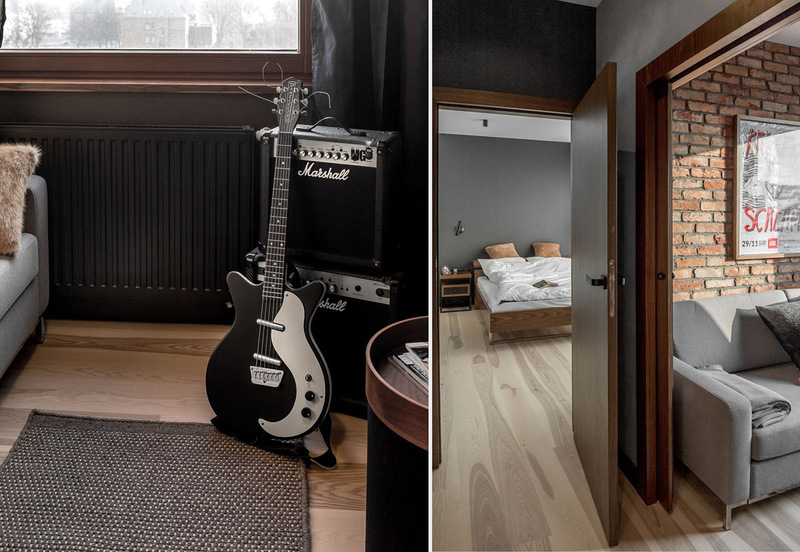 As the sitting room offers more musical fixtures in an electric guitar and amp, its black wall and wooden floor link back to the bedroom and corridor. 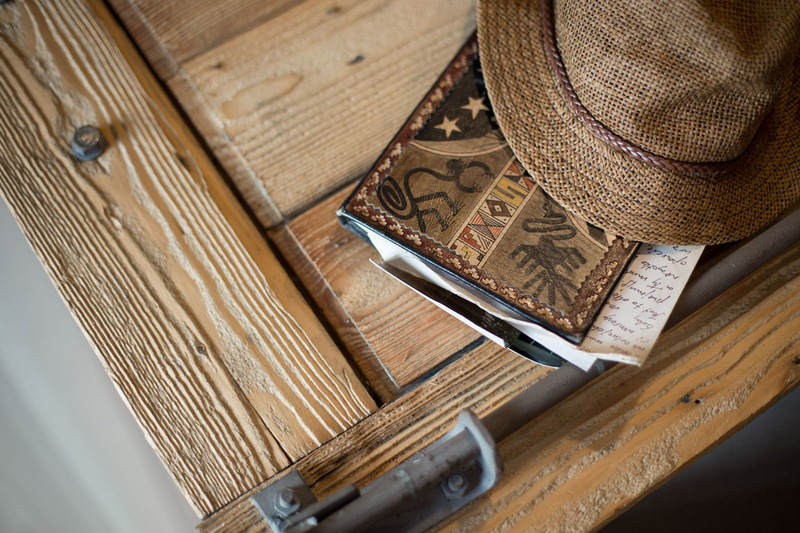 Wood closes off the wardrobe and covers a side table, a perfect place for a weary diary and hat from yesteryear.